Swatch: THIRD version of Catrice Sold Out For Ever!? 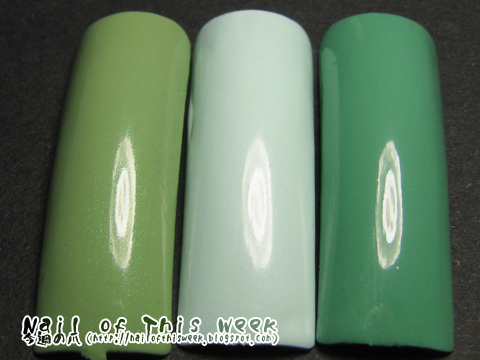 : Nail of This Week. Swatch: THIRD version of Catrice Sold Out For Ever!? 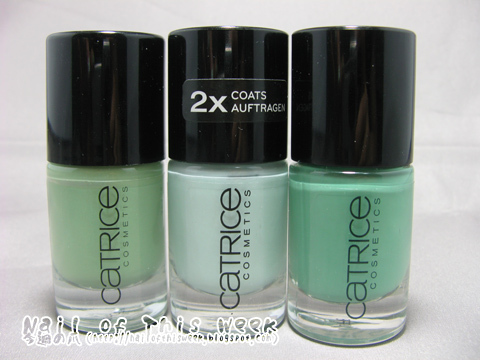 Last week was busy week for Catrice fans, that they launched their new shades for fall/winter 2012. And meanwhile, I found they also re-launched their well-known Sold Out For Ever; but with the different shade, AGAIN. I’ll let first two photos to say everything. Even just from bottle and without the swatch, difference is clear. Different shade, same name, same product code. How it can be possible? No way, Catrice, no way, I must say this is completely WRONG. Now let’s see on the tip. Again different shade. And here I’d like to focus on detailed “difference” for each shade, so you won’t get wrong one from what you really need. All of these are two thick coats without topcoat. 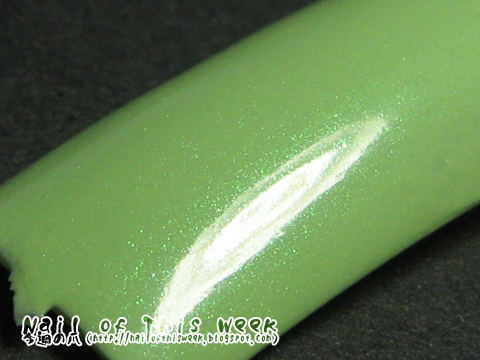 Light yellowish mint green with GREEN shimmer. Shimmer is a bit subtle but still enough to shine even under the room lamp or shade. 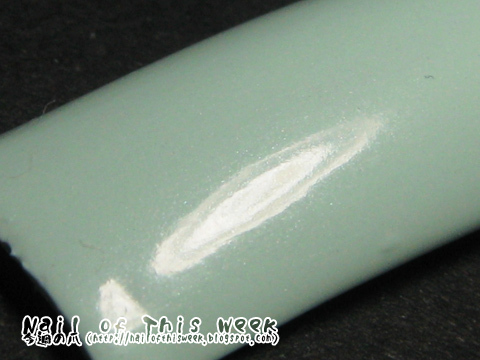 Formula is smooth but bit sheer so need thick two coats or thin three coats to get the color. As known as dupe of Chanel Jade or Dior Waterlily, I’ve heard THAT is the reason this shade got its name as “Sold Out For Ever”; pretty ironically. Bold mint green CREME. NO shimmer at all. Looks a bit similar with 1st version under dark place; I almost mistook this as a original color at the shop. Thanks to my hub who found this doesn’t have any shimmer in it, which is big difference. 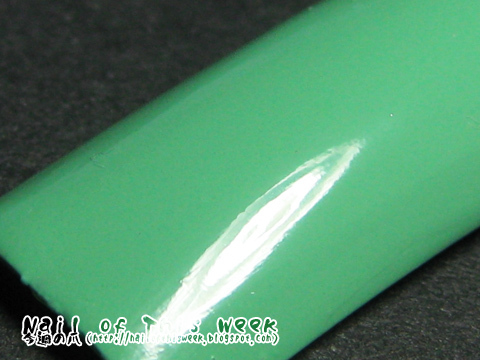 Actually this one is not a disappointing color, formula is smooth, easy control and ONE COATER. So overall…I don’t really understand what Catrice is doing. Especially third one - which came out recently - is pretty good polish by its color and formula, it’s really a pity that this recent one doesn’t have its own name. Anyway, I hope this post will help not to get confused…Same name with two different shade is not that rare, but now it’s THREE…Already enough to mix up one’s mind. O_o that really doesn´t make any sense! When I saw the first picture I was pretty sure the very left polish would be the one from the current limited edition. TO see that those are the "exact" same polishes blows my mind. The one good thing about this is, that I can see a pretty nice ombre nail comming out of those "same" colours. Wow! I mean, I already saw your pic on twitter but to see so detailled and so much evidence for bad quality control, it leaves me speechless. it's a bit crazy to have 3 different polishes with the same name! great post! It IS crazy! I've never seen such a stuff. NEVER. Or maybe that's just my imagination losing controll..
Have you noticed that they changed the color of Blue Cara Ciao as well with the last influx of new colors? I have one I bought at the beginning of the year and the new (more intense) one I got shortly after the new colors came out. They're two different polishes with the same number/name. First, sorry for super-late reply. I hope I didn't make you upset!